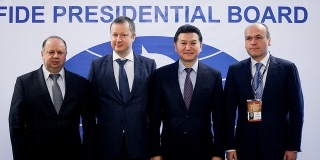 The 1st quarter FIDE Presidential Board was held on 30th March at the conference room of Ugra Classic Complex in Khanty-Mansiysk, Russia. The meeting was opened by FIDE President Kirsan Ilyumzhninov and Khanty-Mansiysk Mayor and Ugra Chess Federation President Vassily Filipenko. Mayor Vassily Filipenko welcomed the guests and wished a pleasant stay in Khanty-Mansiysk. President Ilyumzhninov thanked the Khanty-Mansi Autonomous Okrug and Ugra Chess Federation for their hospitality and excellent organization of the FIDE World Candidates Tournament. The Board greeted the newly elected President of Russian Chess Federation Andrey Filatov, who attended the meeting together with the senior RCF officials. The President then gave a report stating what he had done since the FIDE Presidential Board in Chennai. Oman and Burkina Faso are accepted as new member federations of FIDE. The application of South Sudan is pending the resolution of the IOC status and the valid federation Statutes. The Board supported President’s request for resignation of General Secretary Ignatius Leong. The Board reviewed the FIDE Commissions’ reports. New International Arbiter, International Organizer, Trainer titles, and over the board titles have been approved. The WCOC report was agreed: there will be four Grand Prix events if we have all four signed by May 31st. If not, the places in the Candidates Tournament will be given one to the World Cup and one to the next highest on the Ratings list, instead of the Grand Prix. As FIDE was informed that three Federations wanted to bid for 2018 Olympiad and no bids had been seen at the time of PB, the PB agreed to extend bidding by 15 days until 15th April. Among other decisions, SPICE Webster and Marshall Chess Club were approved as FIDE Academies on the request by the FIDE Trainers Commission. The Board condemned by unanimous vote the former World Champion Garry Kasparov for insulting the International Olympic Committee and its President Thomas Bach.